What is LogicWorks for Windows? 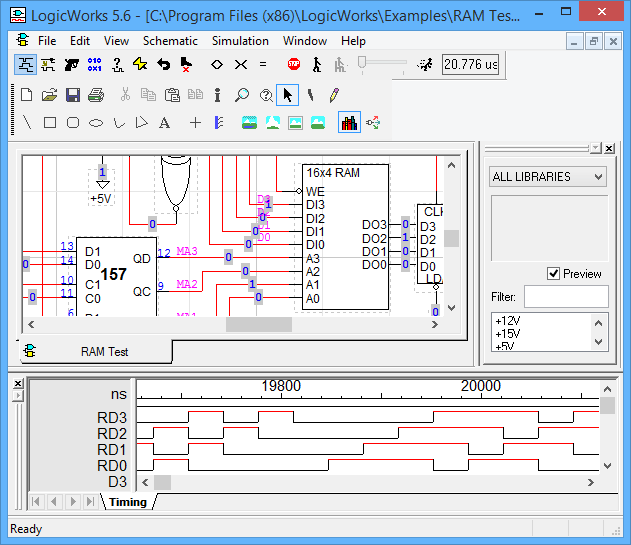 LogicWorks is an innovative interactive circuit design tool that allows you to run quick and efficient simulations on screen. It’s the single fastest and most reliable solution to help you learn digital logic. Apart from the power of the software, it comes with unmatched flexibility, enabling you to create and test a virtually unlimited number of circuit elements from your computer. This allows for greater and more efficient learning process and helps you study advanced concepts in shorter time. Please note that this feature is currently not available for Macintosh. Windows users, however, will now have the opportunity to use a subset of the standards VHDL language to describe and simulate circuits. With this innovative feature, LogicWorks now enables you to mix devices and circuits, described in the form of schematic designs with blocks, described in text using VHDL. See the VHDL page for a more detailed description of the language implementation in this version. To enhance your learning process, LogicWorks comes with a full schematic editor, including bussing, multi-level Undo and Redo, interactive connection tracing, and a number of other features. Any change you make to the signal connection or the device parameters will be reflected instantly in the timing waveforms and probes, placed on the diagram. LogicWorks is fully compatible with our professional design package, DesignWorks. You can now have your own copy of Logic works on your Window-based or Macintosh computer and then transfer your designs to DesignWorks for more powerful and efficient integration, analysis and testing. How do I buy LogicWorks? Purchase the Windows version of LogicWorks directly from your website. The Macintosh version can be purchased from the Apple’s App Store. Please note that the current Macintosh version does not include the VHDL features. Where do I get support for LogicWorks? Please see our LogicWorks support site for FAQs and support contact information.